Shrouded in political expediency, hampered by internal power struggles, international espionage and doublespeak that makes Washington's spin doctors proud, Kamal's mission is a nightmare of rampant militant fundamentalism that threatens to choke and take Pakistan hostage. For him, the fight is not just for freedom, but the survival of a nation. Born in Pakistan's troubled Swat Valley, educated and raised in the United States, Khalid returned to Pakistan almost 17 years ago and fell in love with his country. 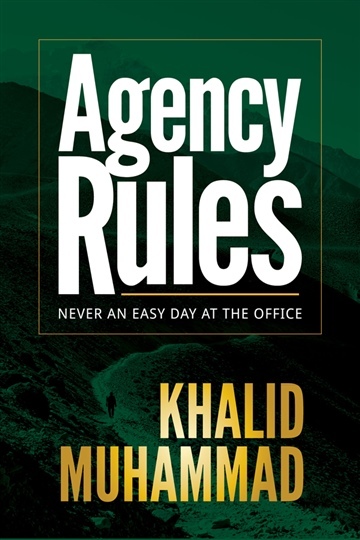 His debut novel, Agency Rules - Never an Easy Day at the Office, is a journey behind the headlines about Pakistan, the world's most dangerous place, to deliver an intense story that will challenge the reader to question what they have been told. Find out more about him at agencyrules.com, @AgencyRulesPK (twitter.com/AgencyRulesPK) or the Agency Rules Facebook page (facebook.com/AgencyRulesPK).